In a sector characterized by remarkable expansion and major technological changes, environmental businesses can only truly succeed when they are able to find and keep enough skilled practitioners. 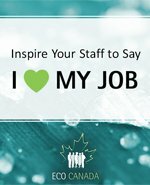 ECO Canada conducted the 2012 Employer HR Strategies study to learn more about which competencies environmental employers look for in their staff and what strategies they use to keep these employees. The findings from this research are both timely and unexpected, with powerful take-away insights for employers, professionals and educators alike.